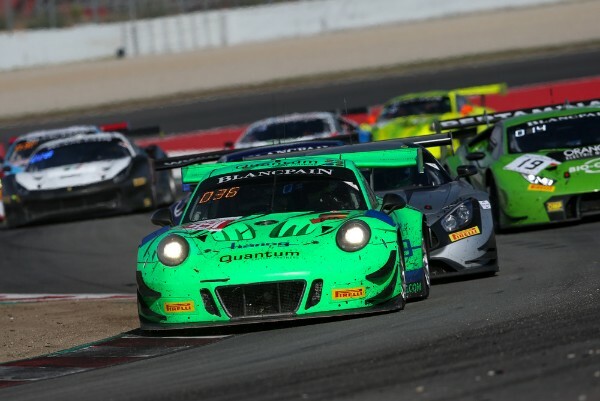 Herberth Motorsport celebrated a podium result with the Porsche 911 GT3 R at the final round of this year’s Blancpain GT Series Endurance Cup in Barcelona, Spain. The all-German trio Jürgen Häring, Edward-Lewis Brauner and Wolfgang Triller concluded the season with second in the Am class for gentlemen drivers with the 500 hp customer sport racer from Weissach. In the Pro category, the Porsche works drivers Romain Dumas, Frédéric Makowiecki (both France) and Dirk Werner (Germany) achieved tenth overall after a pursuit race through the field over the entire three-hour duration. A total of 52 GT3 vehicles took up the challenge on the 4.655-kilometre circuit just outside Barcelona. Dumas, Makowiecki and Werner had to tackle the race from 37th after several interruptions in qualifying hampered them from posting a better grid position. Despite receiving a drive-through penalty in the first third of the race, the No. 911 took the flag in tenth place, beating 16 of the 24 rivals in the professional class. In the Am class, Häring, Brauner and Triller had started from the third grid spot. Triller, as last year’s B class champion in the Porsche Carrera Cup Deutschland, moved into second place after the final pit stop and, in spite of a late safety car phase, defended his position to the flag. For Herberth Motorsport, this marks the second podium in its class in this season’s Blancpain GT Series Endurance Cup. At the Silverstone race in mid-May, the drivers clinched third with the No. 991 car. The Blancpain GT Series Endurance Cup is reserved for race cars that comply with FIA GT3 regulations. Storied racetracks, cost-effective conditions of participation and equality in terms of technology thanks to the Balance of Performance form the framework of this customer-oriented championship. The season highlight, the 24 Hours of Spa, is also part of the global Intercontinental GT Challenge, in which Porsche teams compete with the 911 GT3 R. SRO Motorsports Group organises both series.